June 16th has been declared as World Sea Turtle Day in honor of Dr. Archie Carr. His work brought the plight of sea turtles to the forefront of our attention, and it was through his work that turned the sea turtles around on their path to extinction towards their recovery. The fossil record indicates that the oceans were once populated with thousands of species of sea turtles, but this legacy is currently held by seven extant species of sea turtles today. Though there are seven sea turtles species today, each species is naturally divided into several different populations, either by barriers to migration or movement of currents during their pelagic phase. These populations can be roughly divided into Regional Management Units, which are discrete populations of sea turtles that appear to use different oceans and nesting grounds from other populations of the same species. So different are these different populations, in fact, that their conditions for nest site selection can also greatly vary. Last year for World Sea Turtle Day, I gave a brief overview of the life cycle of sea turtles, as well as talked about the two most commonly found sea turtles in Singapore. This year, I will talk about each sea turtle species in an easy-to-refer info-style format. Specifically, I will cover the conservation status, distribution, the regional management units, diet, threats, and the most prominent feature for each species. In-water Distribution: Primarily tropical, with lesser extent in subtropical waters of the Atlantic, Indian, and Pacific Ocean. Regional Management Units: East, West, and Southwest Atlantic; Eastern and Southwest Pacific. Diet: Primarily feed on sponges, but can also be seen eating small crustaceans. Threats: The most prominent threat to hawksbill sea turtles is the tortoiseshell trade. The beautiful patterns seen on their carapace are highly prized by consumers for accessories such as combs and bracelets. Most Prominent Feature: Its beak, hence the name Hawksbill Sea Turtle. The head is long and narrow with a large beak, which allows the sea turtle to reach into tiny crevices within the coral and rip out sponges. Hawksbill Sea Turtles are often poached for their shells, which are then used to make accessories such as combs, bracelets, and hairbands. In-water Distribution: Tropical, with sightings seen as far north as the United Kingdom, but most likely passively drifted there when it was caught in the wrong current stream. Nesting Distribution: Tropical, as far north as southern Japan and as far south as Southern Madagascar. Regional Management Units: East, Northwest, South, Central, Southwest, and South Caribbean Atlantic; Northeast, Northwest, Southeast, and Southwest Indian Ocean; Mediterranean; East, North Central, Northwest, South Central, Southwest, West Central, and Western Pacific (i.e. South East Asia, of which Singapore is a part of). Diet: Green Sea Turtles are omnivorous when they are neonates and juveniles, but switch to an herbivorous diet of sea grass when they recruit into near-shore environments. Adults have been seen eating jelly fish. Threats: The most prominent threat to Green Sea Turtles is the harvesting of eggs and adults on nesting beaches for food. Some countries allow for the legal take of eggs and adults despite their international conservation status. However, countries that do have legislation protecting nesting beaches of Green Sea Turtles have rampant black markets for Green Sea Turtle products. Most Prominent Feature: Adult green sea turtles really are very green, which is attributed to their herbivorous diet. They have gentle looking faces, which suits their personality as one of the more gentle sea turtle species in the world. Nesting Distribution: Tropical and temperate waters such as the Gulf of Mexico, Central America, South Africa, Shark Bay in Australia, southern Japan. Regional Management Units: Northeast, Northwest, and Southwest Atlantic Ocean; the Mediterranean; Northeast, Northwest, Southeast, and Southwest Indian Ocean; and the North and South Pacific. Threats: Prominent threats are fisheries bycatch and direct take of eggs and adults on nesting beaches. Most Prominent Feature: Their heads are huge, hence the name Loggerhead Sea Turtle. Their heads are muscular and designed to crush and crack the hard exoskeletons of crustaceans. In-water Distribution: Only found in the waters of temperate and tropical Australia, from Queensland through the Torres Straits in Northern Territory and Papua New Guinea, the Kimberley’s, Pilbara, Ningaloo Reef and Shark’s Bay. Nesting Distribution: Queensland, Northern Territory, the Kimberley’s, Pilbara, Eighty Mile Beach, Shark’s Bay. Regional Management Units: Southeast Indian Ocean and Southwest Pacific Ocean, but more management units may be delineated with additional genetic information. Threats: Currently unclear, though there have been records of direct predation by invasive foxes and feral dogs, habitat degradation, and bycatch. Most Prominent Feature: True to their name, flatback turtles are indeed very flat turtles. Nesting Distribution: Tropical: Central America, South America, Africa, Sri Lanka and India, Malaysia, and several nesting populations in tropical Australia. Regional Management Units: East and West Atlantic Ocean; Northeast Indian Ocean; the Northeast Indian arribada Ocean population, and the West Indian Ocean; Eastern Pacific, Eastern arribada Pacific population, and the Western Pacific Ocean population. Threats: The greatest threat to Olive Ridley Sea Turtles are direct exploitation at nesting beaches. Arribada populations, such as in northern India, see mass nesting of females on single nights, where their eggs or adults are easily picked off. Most Prominent Feature: The smallest sea turtle in the world, with a round to heart-shaped carapace. They also under arribadas, which is the mass nesting of females. Males appear to stay pelagic throughout their life, only mating with females when en route to breeding waters. Regional Management Unit: Only one Regional Management Unit identified, which is the Northwest Atlantic Ocean RMU, which includes the Gulf of Mexico and the entire eastern seaboard of the United States. Threats: Direct take of eggs and adults during their arribada in a single site in the United States has caused the population to plummet. Conservation actions for the Kemp’s Ridley Sea Turtle were relocating nests in the Gulf of Mexico and incubating them on beaches on Padre Island, Texas, as well as releasing juveniles from captive-rear and release programs. Most Prominent Feature: If you happen to be in the Gulf of Mexico and stumble upon a mass nesting event of sea turtles, it is more than likely that you have come across Kemp’s Ridley Sea Turtles. These sea turtles, like the Olive Ridley Sea Turtles, undertake the arribada, though their nesting populations have plummeted. In addition, their heads are narrower and longer than Olive Ridley Sea Turtles. In-water Distribution: Have the widest distribution of all sea turtles, having been seen as far north as Norway and as far south as Patagonia. This is attributed to their size, as they have grown so large that they are able to generate their own heat, and hence are able to tolerate more frigid waters. Nesting Distribution: Tropical and sub-tropical, with populations in east and west coast of the United States, Caribbean, southern and western Africa, Indonesia, Malaysia, Sri Lanka, and northern Australia. Regional Management Units: Northeast, Southeast, and Southwest Atlantic Oceans; Northeast and Southwest Indian Oceans; East and West Pacific Ocean. Threats: Bycatch and direct take of adults and eggs are direct threats to the populations, while coastal development of their nesting grounds prevents them from nesting and bringing in new recruits into the populations. Most Prominent Feature: Their size. These are the largest sea turtles in the world and are a phenomenal animal to be in the presence of. Their common and scientific name is also attributed to the fact that leatherbacks do not have a hard carapace, but rather a leathery skin layer. Hawksbill and green sea turtles have been recorded in Singapore on several occasions, with the former finding nesting areas on the beaches within Singapore. The leatherback sea turtle has only been recorded once in Singapore, with the specimen taken and preserved in the now Lee Kong Chian Natural History Museum. There are several conservation actions being taken in Singapore. For example, Sisters’ Islands has recently been declared as a Marine Park, with plans to establish a sea turtle hatchery on the island. Considering that Singapore coastlines and beaches are constantly used by visitors, translocating sea turtle nests to a hatchery far away from the hustle and bustle of urban Singapore may be a much needed relief and safe haven for incubating nests. Call the National Parks Board on their hotline at 1800 471 7300. Take note of your location (barbecue pit number, the zone you are in, etc.) so they are able to come down to the site. Thanks for reading, and have a turtley awesome day! Pesta Ubin is happening in full swing! Check out all the action on the Pesta Ubin Blog! The Friends of Ubin Network (FUN) have organized this amazing 10-week long celebration to showcase this amazing island to Singapore! HSS is joining the fun as well! For the next few weeks, we will be collaborating with Strix Wildlife Consultancy and the Vertebrate Study Group to do guided walks at Pulau Ubin! So far, we have done a few walks already. Check out these pictures from our last few walks! Each walk will cost $15 per pax, with payment made on the spot! There is no need to register. Simply meet at the Assembly Area (In front of the Ubin NParks Office) 30 minutes before the walk starts! Here’s a handy map that you can use to find the meeting point! 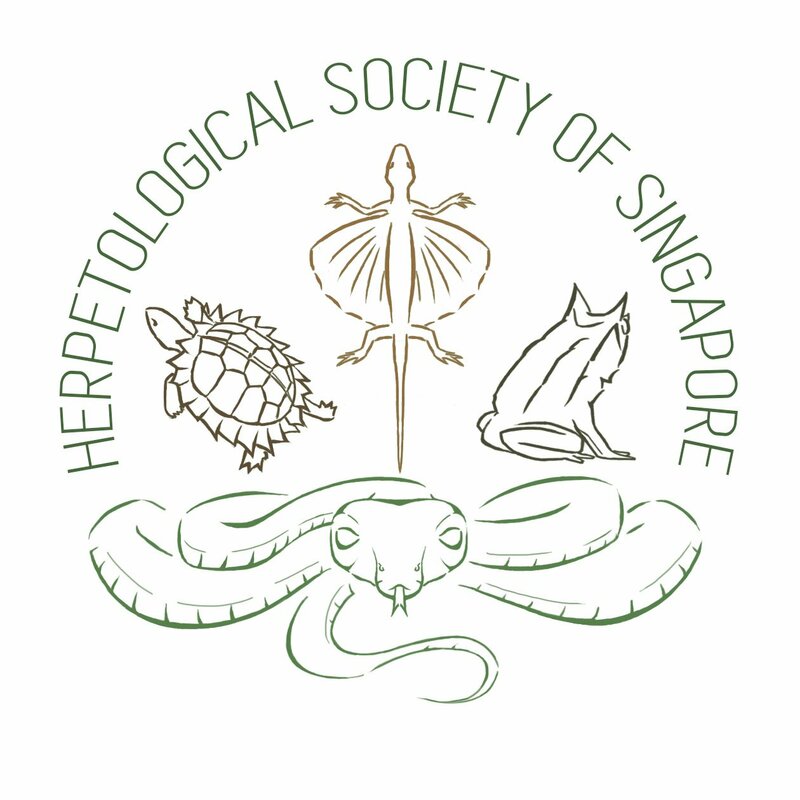 We will resume our regular herp walks in August! See you on Ubin!